When the name of a billionaire Silicon Valley entrepreneur and venture capitalist popped up on the GOP's list of Republican National Convention speakers — in one of the week's most desired spots no less — people had a lot of questions. Who is this guy? Why him and why a few slots before Trump's big speech? While Trump hasn't found much favor among Silicon Valley's elite, there's one tech-minded investor campaigning for the GOP's official nominee. But job titles aside, Peter Thiel's speech at the Republican National Convention is remarkable for one specific reason: his sexual orientation. 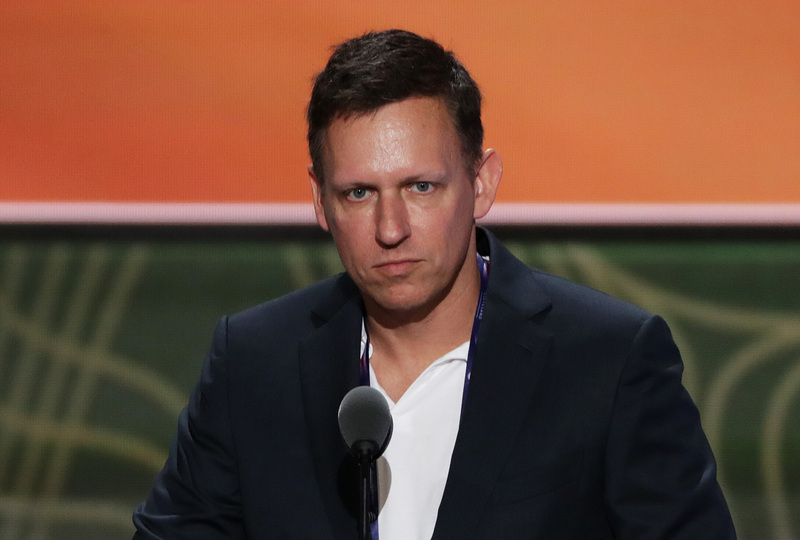 While addressing Republican Party leaders, Thiel, a Facebook board member and former PayPal CEO and co-founder, said he was proud to be openly gay, a historic first for a GOP convention speech. Yet Thiel's speech seemed oddly timed given the socially conservative party platform Republicans kicked off their nominating convention with earlier in the week. Not only did the GOP reaffirm their opposition to gay marriage, the party also condoned conversion therapy for children who identify as LGBTQ. For those attuned to Silicon Valley, Thiel's support for Trump isn't exactly news. The billionaire tech investor — who has previously identified as libertarian — was named a Trump delegate in May. Thiel has said he agrees with Trump's belief that America shouldn't be involved in foreign wars. But he isn't the first openly gay person to speak at a Republican National Convention — Rep. Jim Kolbe spoke in 2000 — he is, however, the first to bring his sexual orientation into his speech, according to The New York Times. Good evening. I'm Peter Thiel. I build companies and I support people who are building new things, from social networks to rocket ships. I'm not a politician. But neither is Donald Trump. He is a builder, and it's time to rebuild America. Where I work in Silicon Valley, it's hard to see where America has gone wrong. My industry has made a lot of progress in computers and in software, and, of course, it's made a lot of money. But Silicon Valley is a small place. Drive out to Sacramento, or even across the bridge to Oakland, and you won't see the same prosperity. That's just how small it is. Across the country, wages are flat. Americans get paid less today than 10 years ago. But healthcare and college tuition cost more every year. Meanwhile Wall Street bankers inflate bubbles in everything from government bonds to Hillary Clinton's speaking fees. Our economy is broken. If you're watching me right now, you understand this better than any politician in Washington D.C.
And you know this isn't the dream we looked forward to. Back when my parents came to America looking for that dream, they found it — right here in Cleveland. They brought me here as a one-year-old, and this is where I became an American. Opportunity was everywhere. My dad studied engineering at Case Western Reserve University, just down the road from where we are now. Because in 1968, the world's high tech capital wasn't just one city: all of America was high tech. It's hard to remember this, but our government was once high tech, too. When I moved to Cleveland, defense research was laying the foundations for the Internet. The Apollo program was just about to put a man on the moon — and it was Neil Armstrong, from right here in Ohio. The future felt limitless. But today our government is broken. Our nuclear bases still use floppy disks. Our newest fighter jets can't even fly in the rain. And it would be kind to say the government's software works poorly, because much of the time it doesn't even work at all. That is a staggering decline for the country that completed the Manhattan Project. We don't accept such incompetence in Silicon Valley, and we must not accept it from our government. Instead of going to Mars, we have invaded the Middle East. We don't need to see Hillary Clinton's deleted emails: her incompetence is in plain sight. She pushed for a war in Libya, and today it's a training ground for ISIS. On this most important issue, Donald Trump is right. It's time to end the era of stupid wars and rebuild our country. Of course, every American has a unique identity. I am proud to be gay. I am proud to be a Republican. But most of all I am proud to be an American. I don't pretend to agree with every plank in our party's platform. But fake culture wars only distract us from our economic decline. And nobody in this race is being honest about it except Donald Trump. While it is fitting to talk about who we are, today it's even more important to remember where we came from. For me that is Cleveland, and the bright future it promised. When Donald Trump asks us to Make America Great Again, he's not suggesting a return to the past. He's running to lead us back to that bright future.